Happy TGIF! Or I guess I should say, "Happy Smurfday!" It's a very exciting day around our house....a day that Linz has been anticipating and talking about for a very, very long time. The new Smurfs Movie comes out today. I wanted to try to get this card on the blog today to share with you because today our schedule is c-r-a-z-y. I won't bore you with the details but it's going to be busy for sure. I've been trying to sketch a few new card ideas for new card classes and I've wanted to come up with a baby card. Doesn't sound too hard, right? Well...it had me stumped when I realized that I don't own any of the current SU! baby themed stamp sets! Can you believe it?? Well, I couldn't. Gotta get a couple of those on my next order. We have lots of friends having babies and I need cards! So...what to do....think...think....THINK.... Well it just so happens that I actually got the new "Stripes" Textured Embossing Folder and I remembered hearing about a technique using it at Convention. So....I tried it out. Guess what?? It worked! WOOT! I was so excited to see how easy it was to use my brayer to ink up the embossing folder and run it through my Big Shot and then do it again in the opposite direction. Then...VOILA!.... Embossed Plaid! Who knew?? I used Pool Party, one of the new In Colors to make the plaid piece and used a piece of Pool Party card stock for the card base. 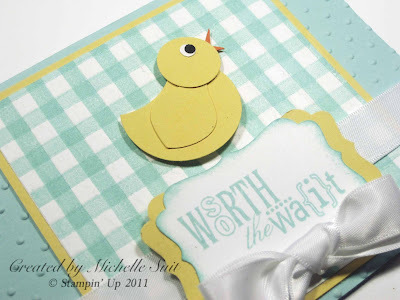 I then used my punches to create the little ducky out of Daffodil Delight card stock.. (A shout out to my upline, Robin Merriman for the "how to's on that! Thanks girlie!!!) I embossed the card base with the Polka Dot Embossing Folder. The stamp is from the "Word Play" stamp set that I highlighted earlier this week and then I punched it out with the decorative label punch and then I sponged the edges with Pool Party to make it "pop". It's a clean and simple card that just has a sweet feel about it. So...there you have it. A fun and easy baby card if you don't have any baby themed stamps on hand like me....or even if you do. SU! IB&C and is $7.95. If you'd like a closer look you can click HERE to check it out on my website. Don't forget my BLOG SPECIAL that's on now through Sunday. For anyone placing an order of $25 today through Sunday you will receive the "Summer Splash" set from the Summer Mini Catalog at 1/2 off!! Wishing you a Smurftastic day!! I just love it! I tend to be a little baby card challenged and this is just perfect! We make cards at church and always need baby cards. Think it would be a cute stamp club project too. Thanks so much for sharing!